Compound interest is arguably one of the most powerful forces on the financial markets – even Einstein was a fan. By helping maximise your returns, it can help you reach your goals quicker than simple interest alone. When you’re calculating interest, whether on a loan, savings account or investment, there are two main options to pick from; simple or compound interest. Simple interest is easy to calculate, but is rarely used in reality. Simple interest is charged on the principal amount (initial deposit) only, and ignores any increase or decrease in the value of this amount over time. For example, If you’re earning 2% interest annually on a principal amount of £1,000, you’ll get £20 every year (2% of £1,000) for as long as you commit to it. Compound interest is essentially the interest that is earned on interest. Taking advantage of the fact that the principal value changes over time, compound interest is when the return you make on an investment, for example, is reinvested and then earns its own return. In the above scenario, the £20 you get as your 2% interest on your £1,000 is then added to the underlying value that interest is calculated from in year two. This means you’ll get 2% of £1,020; £20.40. Compound interest helps a sum grow faster than by just interest itself, and can maximise your returns, especially with larger values and over a longer time-horizon. In reality, compounding occurs more frequently than once a year, with popular compounding intervals being quarterly, monthly and daily – although there are other intervals that can be used. 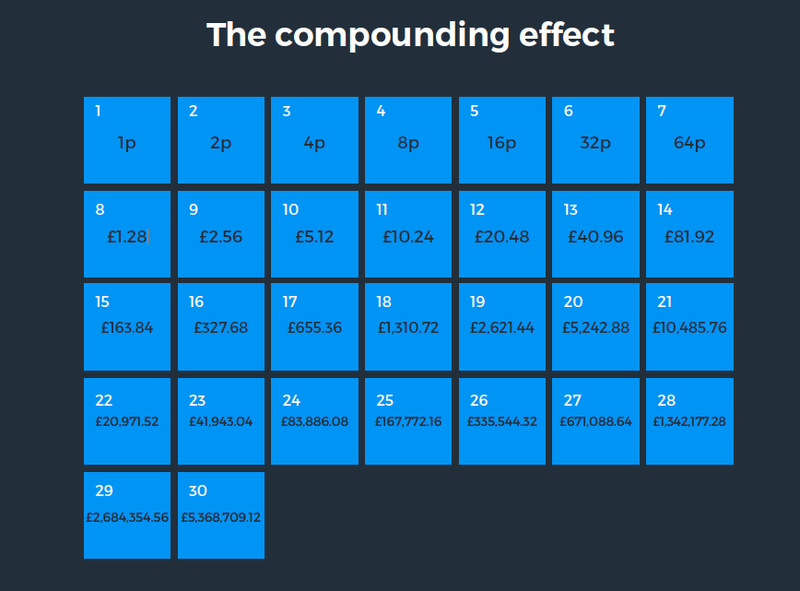 The rate at which compound interest grows really depends on how often compounding occurs. The higher the number of compounding periods, the faster compound interest will grow – in theory. For example, imagine you now have £10,000 in an ISA that pays 2% interest on your savings once a year. After 12 months, you’ll have £10,200. If you had put it in a savings account that paid 1% semi-annually, you’d have £10,201 after 12 months. The first interest payment would be 1% on £10,000, taking the amount in your savings account to £10,100. The second interest payment would be 1% of £10,100, so £101 – taking the total return in the year to £201. To highlight the impact this could have on your pension, imagine you’re offered £500,000 today, or 1p today, which is doubled everyday for 30 days. Which would you choose? Whilst you might jump at the chance of having £500,000 today, you could get over £5 million if you went for the second option – 1p that is doubled every day for 30 days. Of course, we want to stress this isn’t at all reflective of the returns you could see investing in the financial markets, but it highlights how powerful compounding can be the more money you have invested and the more frequent the compounding periods. You can see from the table that progress is slow at the start. It takes 15 days to get from 1p to over £160, but just 15 days after that to get to £5.4 million. Essentially, the more money you can keep in the markets instead of paying unnecessarily expensive fees, the better. Where P = Principal, i = nominal annual interest rate, and n = number of compounding periods. Imagine you take out a 10 year loan of £10,000 that has an interest rate of 5% that compounds annually. Due to the impact of compounding, the effective rate of interest will actually be 6.28% over the 10 years, compared to the initial 5%. Now imagine you take out the same 10 year loan of £10,000 that has an interest rate of 5%, but this time it compounds semiannually. Because the interest rate is paid twice a year, the 5% is divided into two, and the number of compounding periods becomes 20. This shows that the amount you pay in interest, or earn as a return when investing, can increase simply due to an increase in the number of compounding periods. How can I start taking advantage of compound interest? In reality, taking advantage of compound interest could mean retiring earlier or with a better retirement income. Here are five tips to make the most of compound interest on your investment portfolio. Before you start investing, make sure you’ve paid off expensive debt and have three months of outgoings saved up in case of an emergency. This means that when you start investing, this money is ring fenced for your future so you can avoid dipping into it when you unexpectedly need money. The more of your money you can keep invested over the long-term, the more you can benefit from compound interest. Perhaps the worst kept secret in personal finance, but the sooner you start saving and investing for your future, the better. A long-term time horizon allows you to take on more risk with your money, which increases your scope for higher returns, and allows you to ride out short-term fluctuations in the value of your investments. This can make a real impact over the long-run and could make all the difference to your pension income. The more money you can keep invested, the better compound interest can work. When you’re paying expensive management fees for a service that isn’t performing as well as you’d like, you could be stifling your returns. The more you spend on fees, the less money you have working hard for you on the financial markets. Don’t wait until you have a lump-sum to start investing, the sooner you can invest your money the quicker it can start working for you. Setting up a direct debit is a hassle-free way to manage your investments, and means you can ignore market noise when it comes to investing your money. You could also benefit from pound cost averaging, which can maximise your return by smoothing out the total amount you pay for an asset over time. When it comes to compound interest, the more money you have invested and your time horizon are key. By reinvesting any dividends or interest you’re paid, you can get more of your money working harder for you as quickly as possible and reap the benefits of compounding. 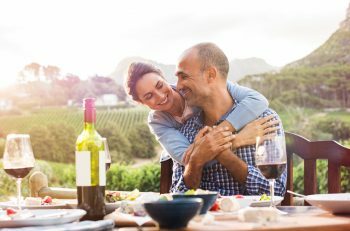 Previous article Saving for a good retirement income: How long will it take? Next article Should I invest in a LISA or a Pension?